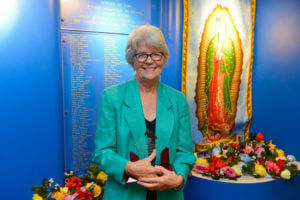 The Center for Legal and Social Justice at the St. Mary’s University School of Law awarded retiring Clinical Professor of Law Lee J. Terán the Santa Maria Justice Award at the Feast of our Lady of Guadalupe on Monday. The faculty of the CLSJ awards the annual Santa Maria Justice Award to an individual or group who has made outstanding contributions to the advancement of legal and social justice. Terán is transitioning from directing the law school’s Immigration and Human Rights Clinic to the position of Senior Professor. She began as an adjunct at St. Mary’s Law in 1992 and became a full-time member of the faculty in 1994. “We are very humbled by the opportunity to thank Lee Terán,” said School of Law Dean Stephen M. Sheppard, J.S.D., describing Terán as the epitome of a servant leader. “Through her career, she has done so much to help so many people” and gave a voice for those who had none. Terán has litigated a number of civil rights cases concerning immigrants and refugees and was formerly a co-director of the Lawyers’ Committee for Civil Rights – Immigrant and Refugee Rights Project. She has written and frequently lectures on issues relating to nationality, immigrant victims of violence and the immigration consequences of crimes. Terán received the 1989 Pro Bono and Professional Responsibility Award from the American Bar Association Section on Litigation, the 1990 Carol Weiss King Award from the National Immigration Project, the 1992 Jack Wasserman Litigation Award from the American Immigration Lawyers Association (AILA), the 1998 Distinguished Faculty Award from the St. Mary’s University Alumni Association, the 2004 Elmer Fried Teaching Award from AILA, and the 2009 Excellence in Legal Service Award from the Mexican American Legal Defense and Educational Fund. View photos from the Feast of Our Lady of Guadalupe here.